The post vorpX 19.1.0 Released appeared first on vorpX - VR 3D-Driver for Oculus Rift. The post vorpX 18.3.0 Released appeared first on vorpX - VR 3D-Driver for Oculus Rift. vorpX 18.3.0 has been released. After four maintenance releases for the 18.2 branch it’s finally time for a slightly bigger release with a bit of feature refinement and also more and enhanced game profiles. Most notable additions are: Dark Souls Remastered, Monster Hunter World, Shadow of the Tomb Raider and Assassin’s Creed: Odyssey. Full List below. Also various other profiles have been added and some existing ones have been enhanced by adding Geometry 3D and/or DirectVR. temporary notification in the headset. - Experienced users can now create better custom profiles by defining HUD/shadow etc. shaders. - Gamepad/VR Hotkey mapping did not work anymore when clicking the buttons with the mouse. - Various UI related fixes/changes. - G3D didn't work anymore in some D3D11 games (e.g. F1 2014). - In various D3D11 games with HUD scaling the HUD was not correctly centered in Z3D mode. - Occasional visual glitches (e.g. black squares on image) in some UE4 games should no longer occur. - In gamepad mode VR controller button states were released although the button was still pressed. - Dishonored 2: Z-buffer wasn't always correctly determined, leading to a 'cross-eyed' view. - Conan Exiles [no BattleEye]: DirectVR head tracking and resolution added. The post vorpX 18.2.0 Released appeared first on vorpX - VR 3D-Driver for Oculus Rift. The post vorpX 18.1.2 Released appeared first on vorpX - VR 3D-Driver for Oculus Rift. vorpX 18.1.2 has been released. Most importantly this release brings enhanced DirectVR for Kingdom Come Deliverance by adding DirectVR head tracking and support for custom resolutions. The latter can improve your framerate considerably. Check the “Custom Resolutions” section in the vorpX help to take full advantage of this feature. Also three new game profiles have been added: The Turing Test, Conarium and Trine 3. Various older profiles that previously were Z3D only now support Geometry 3D and/or additional DirectVR features. Please check this post for information about the recent major update 18.1.0. The post vorpX 18.1.0 Released appeared first on vorpX - VR 3D-Driver for Oculus Rift. vorpX 18.1.0 has been released. The main focus of this update was creating new game profiles and adding Geometry 3D to quite a few existing ones that were Z3D only before. Most notable additions are: Kingdom Come Deliverance, Titanfall 2 and Nier Automata. Also don’t miss the beautiful Fe and Unravel in immersive screen mode. And last but not least relax with one or the other Telltale adventure. Special tip for action fans: Bayonetta is a sight to behold in 3D on the huge screen. Find the full list in the changelog below. The OpenGL render path has been rewritten from the ground and is now capable of decent single frame Geometry 3D like its DirectX counterparts. The vorpX desktop viewer now works with Oculus Home 2.0. vorpX also can handle issues in regard to fullscreen games on some PCs now that are caused by Oculus Home 2.0. - vorpX UI cursor speed was too low with high DPI mice under certain circumstances. The post vorpX 17.3.0 Released appeared first on vorpX - VR 3D-Driver for Oculus Rift. vorpX 17.3.0 has been released. This is a major release that brings new and improved functionality as well as new game profiles to vorpX. The new Direct VR Settings Optimizer superseeds the old config app optimizer, providing more automation and new features like perfect FOV and optimized game resolutions. All 90+ optimizer profiles have been redone to take advantage of this new system and new optimizer profiles have been added. Immersive Screen Mode provides a third way to play games with vorpX in addition to full VR mode and cinema mode. Basically this is a cinema mode preset tweaked for maximum immersion that is great for playing third person games or games where adjusting the field of view for full VR is not possible. Also used as new default for unsupported games. If you don’t need the controller mapping visualization anymore after playing a game for a while, animated hands can enhance immersion. Best used with Oculus Touch, animation options with Vive wands are limited due to missing sensors. Quite a few new games have been added to the list of supported titles, many existing profiles have been improved by adding Geometry 3D. them compatible with this system. TLDR: one (or no) click auto configuration for more games. out unsupported games of any kind. animation options with Vive wands are limited due to missing sensors. - Various D3D11 Geometry 3D rendering path improvements, allowing G3D for more D3D11 games. - Direct VR scanner more reliable with a gamepad connected in games where that was an issue. - D3D9 hooking less timing sensitive, improves hooking in various games (e.g. Unity engine). - Improved hooking in some problematic games, e.g. Witcher 3. - Audio device switching safer/more reliable. - Handling of potential injection conflicts with various overlays (Steam/GOG/UPlay/Origin). - DirectVR memory scan cache didn't always work as intended. - DirectVR memory scanner: various glitches related to enabling/disabling fixed. - All XInput versions are now handled for more reliable controller override. - All DirectInput versions are now handled for more reliable controller override. - Less games with game input still registering while using the vorpX menu. - More sophisticated deadzone handling for VR controllers/gamepad emulation. - (Much) more efficient D3D9 font rendering. - More complete D3D9Ex support, mostly useful for video players. - Better cursor/mouse capturing for playing games in windowed mode that don't support that well. - Uses latest Oculus/OpenVR SDK. - Dozens of smaller changes that would go beyond the scope of this changelog. - Elder Scrolls: Oblivion: various fixes and improvements. - Mirror's Edge: Direct VR scanner improvements, water reflections fixed. - Bioshock Infinite: water reflections fixed. - ABZÛ: Occasional flicker fixed. - Dishonored: water reflections fixed. - The Vanishing of Ethan Carter: water reflections fixed. - Crysis: water reflections fixed. The post vorpX 17.2.0 Released appeared first on vorpX - VR 3D-Driver for Oculus Rift. vorpX 17.2.0 has been released. This release focuses on enhancing Direct VR functionality/stability for existing Direct VR games and additional 3D and Direct VR profiles. Some Direct VR scan results are now cached between sessions. E.g. field of view in Bethesda RPGs or the full result in Source engine games. RPGs or the full result in Source engine games. - Deus Ex: Human Revolution: Direct VR added. The post vorpX 17.1.0 Released appeared first on vorpX - VR 3D-Driver for Oculus Rift. The post vorpX Hotfix 16.2.1 Available Now appeared first on vorpX - VR 3D-Driver for Oculus Rift. vorpX hotfix 16.2.1 has been released. This is a hotfix release that fixes the two issues below. The next big vorpX update with new features will be released soon. Stay tuned. If you already own vorpX, it should auto-update when you start vorpX Control next time. If it doesn’t for some reason, simply use the web installer that you received when you purchased vorpX. It will download the latest version available. If you don’t have your web installer anymore, you can get a new one here. 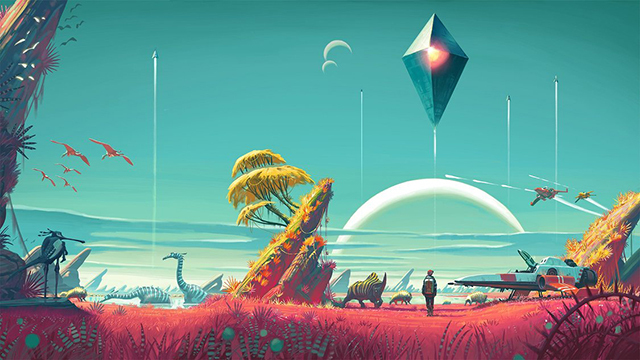 The post Experimental No Man’s Sky Profile & What’s Up Next appeared first on vorpX - VR 3D-Driver for Oculus Rift. With the next vorpX version not far away it’s finally time for another “What’s Up Next” post. But before I come to that here’s a little bit of info regarding No Man’s Sky, probably the most anticipated game of the summer. This one wasn’t really expected to work at all in 3D since it uses OpenGL graphics instead of Direct 3D. OpenGL 3D support is mostly limited to older OpenGL games with vorpX, but surprisingly No Man’s Sky works with full Stereo 3D. If you have a beefy gaming rig, exploring the beautiful worlds of this game in VR is simply stunning. Some may take a more technical approach at defining what VR is for them, I however would almost go so far to say a game like No Man’s Sky experienced with a VR headset truly is the “true” VR. Exploring the sights and sounds of strange new worlds you could only imagine otherwise, immersed in a way that no TV or monitor could ever provide. With enough room left for your own fantasy, your own little stories, instead of just following paths laid out by others like in so many blockbuster games these days. Not much comes close to that. Vive controller support with convenient ingame mouse/keyboard mapping similar to the vorpX gamepad mapper. Also comes with additional/optional gesture based movement. And since sometimes I like to waste a little bit of time for details noone will notice, controllers are discreetly lit by the environment color to better fit into the game visually. For those who are wondering: expanding this to Oculus Touch controllers will be easy once Touch is released. Spherical and stereo-cubemap environments for Virtual Cinema Mode: those of you who like more individual environments can now easily import most 360° photos and stereo cubemaps and use them as a background for vorpX’s Virtual Cinema Mode. VR surround videos for vorpX’s video player mode: often requested, finally here, now vorpX allows you not only to watch ‘normal’ 2D/3D movies, but also the most common types of VR surround videos with MPC-HC (preferred), VLC or any other video player that vorpX can hook into. Color correction: Being optimized for monitors some games look better on the headset with a little bit of extra color correction. With the next vorpX you will be able to adjust gamma (brightness) and saturation individually for every game easily in the vorpX ingame menu. As always there are also a lot of smaller enhancements and bugfixes beyond the scope of this post.